What type of plastic offers the best resistance to various chemicals? Polypropylene is almost as resistant as polyethylene, but with a few specific chemicals it offers superior resistance. It can also be autoclaved and is better for use in higher temperature situations. 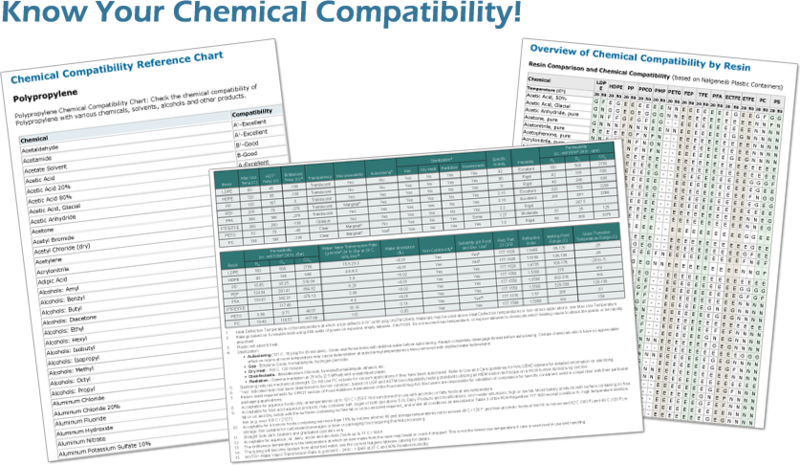 Chemical Resistance Reference Charts for Plastic Containers: We have several chemical compatibility reference charts to help you determine the appropriate resin for your specific chemical needs. Please note that these charts are for general reference only. We have aggregated this data from dozens of sources and any single piece of data cannot be guaranteed. Additionally, many factors affect the chemical resistance of a given plastic product including the concentration/purity of the chemical, working temperature, wall thickness and condition of the container, etc. It is your responsibility to test a container and chemical together ensure compatibility under your unique circumstances. E 30 Days of constant exposure causes no damage. Plastic may tolerate for years. F Some effect after 7 days to the reagent. The effect may be crazing, cracking, loss of strength or discoloration. N Not recommended. Immediate damage may occur. Depending on the plastic, the effect may be severe crazing, cracking, loss of strength, discoloration deformation, dissolution or permeation loss. The chemical compatibility of LDPE and HDPE on this chart is tested at 20°C: and 50°C: for 7 days and 30 days (if applicable) with constant exposure. 1.4-dioxane LDPE / HDPE at 20°C: little or no damage after 30 days. LDPE at 50°C: shows some effect after 7 days. Acetaldehyde LDPE / HDPE at 20°C: little or no damage after 30 days. HDPE at 50°C: shows some effect after 7 days. LDPE at 50°C: immediate damage may occur. Acetic Acid 5 % LDPE / HDPE at 20°C-50°C: little or no damage after 30 days. Acetic Acid, glacial 50% LDPE / HDPE at 20°C: little or no damage after 30 days. LDPE at 50 °C: immediate damage may occur. Acetone LDPE / HDPE at 20°C-50°C: damage may occur. Allyl Alcohol LDPE / HDPE at 20°C-50°C: little or no damage after 30 days. Aluminum salts LDPE / HDPE at 20°C-50°C: little or no damage after 30 days. Amino acids LDPE / HDPE at 20°C-50°C: little or no damage after 30 days. Ammonia LDPE / HDPE at 20°C-50°C: little or no damage after 30 days. Ammonium carbonate saturated LDPE / HDPE at 20°C-50°C: little or no damage after 30 days. Ammonium phosphate LDPE / HDPE at 20°C-50°C: little or no damage after 30 days. Ammonium sulphate LDPE / HDPE at 20°C-50°C: little or no damage after 30 days. Amyl chloride HDPE at 20°C: shows some effect after 7 days. HDPE at 50°C & LDPE at 20°C-50°C: immediate damage may occur. Aniline LDPE / HDPE at 20°C: little or no damage after 30 days. Benzene LDPE / HDPE at 20°C-50°C: damage may occur. Benzyl alcohol LDPE / HDPE at 50°C: immediate damage may occur. HDPE at 20°C: shows some effect after 7 days. Boric acid LDPE / HDPE at 20°C-50°C: little or no damage after 30 days. Bromine LDPE / HDPE at 50°C: immediate damage may occur. Butyric acid LDPE / HDPE at 50°C: immediate damage may occur. Calcium chloride LDPE / HDPE at 20°C-50°C: little or no damage after 30 days. Calcium hydroxide saturated LDPE / HDPE at 20°C-50°C: little or no damage after 30 days. Carbon tetrachloride HDPE at 20°C: shows little or no damage after 30 days. LDPE at 20°C & HDPE at 50°C: show some effect after 7 days. LDPE at 50°C: not recommended. Chlorine 10% in water LDPE / HDPE at 20°C: shows little or no damage after 30 days. LDPE at 50°C: shows damage and is not recommended. Chlorobenzene Immediate damage may occur. Chloroform LDPE / HDPE at 20°C: show some effect after 7 days. LDPE / HDPE at 50°C: immediate damage may occur. Chromic acid 10% LDPE / HDPE at 20°C-50°C: little or no damage after 30 days. Chromic acid 50% LDPE / HDPE at 20°C-50°C: little or no damage after 30 days. Citric acid 10% LDPE / HDPE at 20°C-50°C: little or no damage after 30 days. Cresol HDPE at 20°C: shows some effect after 7 days. LDPE at 20°C-50°C & HDPE at 50°C: show immediate damage. Cyclohexane LDPE / HDPE at 50°C: immediate damage may occur. LDPE / HDPE at 20°C: show some effect after 7 days. Diethyl ketone LDPE / HDPE at 20°C-50°C: damage may occur. Dimethylsulfoxide LDPE / HDPE at 20°C-50°C: little or no damage after 30 days. Ethanol 95% LDPE / HDPE at 20°C-50°C: little or no damage after 30 days. Ethyl acetate LDPE / HDPE at 20°C-50°C: little or no damage after 30 days. Ethyl benzene HDPE at 20°C: shows some effect after 7 days. Ethylene glycol LDPE / HDPE at 20°C-50°C: little or no damage after 30 days. Ethylene oxide HDPE at 20°C: shows little or no damage after 30 days. LDPE at 20°C: and LDPE/ HDPE at 50°C: show some effect after 7 days. Ferric chloride LDPE / HDPE at 20°C-50°C: little or no damage after 30 days. Fluoride LDPE / HDPE at 20°C-50°C: little or no damage after 30 days. Fluorine HDPE at 20°C: shows little or no damage after 30 days. LDPE at 20°C: shows some effect after 7 days. Formaldehyde 10% LDPE / HDPE at 20°C-50°C: little or no damage after 30 days. Formaldehyde 40% LDPE / HDPE at 20°C-50°C: little or no damage after 30 days. Glycerol LDPE / HDPE at 20°C-50°C: little or no damage after 30 days. Hexane HDPE at 20°C: shows little or no damage after 30 days continuous use. HDPE at 50 °C: shows some effect after 7 days. LDPE not recommended at any temperature. Hydrochloric acid 20% LDPE / HDPE at 20°C-50°C: little or no damage after 30 days. Hydrochloric acid 35% LDPE / HDPE at 20°C-50°C: little or no damage after 30 days. Hydrochloric acid 5% LDPE / HDPE at 20°C-50°C: little or no damage after 30 days. Hydrocyanic acid LDPE / HDPE at 20°C-50°C: little or no damage after 30 days. Hydrofluoric acid LDPE / HDPE at 20°C-50°C: little or no damage after 30 days. Hydrofluoric acid 4% LDPE / HDPE at 20°C-50°C: little or no damage after 30 days. Hydrofluoric acid 48% LDPE / HDPE at 20°C-50°C: little or no damage after 30 days. Hydrogen peroxide 3% LDPE / HDPE at 20°C-50°C: little or no damage after 30 days. Hydrogen peroxide 30% LDPE / HDPE at 20°C-50°C: little or no damage after 30 days. Isobutyl alcohol LDPE / HDPE at 20°C-50°C: little or no damage after 30 days. Isopropyl alcohol LDPE / HDPE at 20°C-50°C: little or no damage after 30 days. Kerosene LDPE / HDPE at 20°C: show some effect after 7 days. LDPE / HDPE not recommended at 50°C, as immediate damage may occur. Lactic Acid 10 % LDPE / HDPE at 20°C-50°C: little or no damage after 30 days. Lactic Acid 90 % LDPE / HDPE at 20°C-50°C: little or no damage after 30 days. Lead acetate LDPE / HDPE at 20°C-50°C: little or no damage after 30 days. Methanol LDPE / HDPE at 20°C-50°C: little or no damage after 30 days. Methyl ethyl ketone Immediate damage may occur. Methyl propyl ketone HDPE at 20°C: shows some effect after 7 days. LDPE at 20°C-50°C & HDPE at 50°C: Immediate damage may occur. Methylene chloride HDPE at 20°C: shows some effect after 7 days. Mineral oil LDPE / HDPE at 20°C: little or no damage after 30 days. LDPE at 50°C: may show immediate damage and is not recommended. n-amyl acetate LDPE / HDPE at 20°C: little or no damage after 30 days. LDPE at 50°C: shows some effect after 7 days or constant exposure. n-butyl alcohol LDPE / HDPE at 20°C-50°C: little or no damage after 30 days. Nitric acid 50 % LDPE at 20°C: shows little or damage after 30 days. HDPE at 20°C & LDPE at 50°C: show effect after 7 days. HDPE at 50°C: shows immediate damage and is not recommended. Nitric acid 70 % LDPE / HDPE at 20°C: show some effect after 7 days. LDPE / HDPE at 50°C: show immediate damage. n-octane LDPE / HDPE at 20°C-50°C: little or no damage after 30 days. Oleic acid HDPE at 20°C-50°C: little or no damage after 30 days. LDPE at 20°C-50°C: shows immediate damage and is not recommended. Oxalic acid LDPE at 20°C: shows some effect after 7 days. HDPE at 20°C and LDPE / HDPE at 50°C: shows little/ no damage after 30 days. Ozone LDPE / HDPE at 20°C: little or no damage after 30 days. Perchloric acid LDPE / HDPE at 20°C: little or no damage after 30 days. Perchloric ethylene LDPE / HDPE at 20°C-50°C: show immediate damage. Phenol LDPE / HDPE at 20°C-50°C: show immediate damage. Phosphoric acid 10% LDPE / HDPE at 20°C-50°C: little or no damage after 30 days. Phosphoric acid 85% LDPE / HDPE at 20°C: little or no damage after 30 days. LDPE at 50°C: shows immediate damage and is not recommended. Phosphorous trichloride LDPE / HDPE at 20°C: little or no damage after 30 days. LDPE at 50°C: has no data available. HDPE at 50°C: shows some effect after 7 days. Potassium carbonate LDPE / HDPE at 20°C-50°C: little or no damage after 30 days. Potassium hydroxide 5 % LDPE / HDPE at 20°C-50°C: little or no damage after 30 days. Potassium hydroxide concentrated LDPE / HDPE at 20°C-50°C: little or no damage after 30 days. Potassium permanganate LDPE / HDPE at 20°C-50°C: little or no damage after 30 days. Propylene glycol LDPE / HDPE at 20°C-50°C: little or no damage after 30 days. Pyridine Immediate damage may occur. Salicylic acid, saturated LDPE / HDPE at 20°C-50°C: little or no damage after 30 days. Silver acetate LDPE / HDPE at 20°C-50°C: little or no damage after 30 days. Silver nitrate LDPE / HDPE at 20°C-50°C: little or no damage after 30 days. Sodium carbonate LDPE / HDPE at 20°C-50°C: little or no damage after 30 days. Sodium chloride, saturated LDPE / HDPE at 20°C-50°C: little or no damage after 30 days. Sodium dichromate LDPE / HDPE at 20°C-50°C: little or no damage after 30 days. Sodium hydroxide 1% LDPE at 20°C-50°C: shows little or no damage after 30 days. HDPE at 20°C-50°C: shows some effect after 7 days. Sodium hydroxide 50% LDPE / HDPE at 20°C-50°C: little or no damage after 30 days. Sodium hypochlorite 15% HDPE at 20°C-50°C: little or no damage after 30 days. LDPE at 20°C: is suitable but at 50°C: shows some effect after 7 days. Sodium nitrate LDPE / HDPE at 20°C-50°C: little or no damage after 30 days. Sodium sulphate LDPE / HDPE at 20°C-50°C: little or no damage after 30 days. Sucrose LDPE / HDPE at 20°C-50°C: little or no damage after 30 days. Sulfuric acid 20% LDPE / HDPE at 20°C-50°C: little or no damage after 30 days. Sulfuric acid 6% LDPE / HDPE at 20°C-50°C: little or no damage after 30 days. Sulfuric acid 60% LDPE / HDPE at 20°C-50°C: little or no damage after 30 days. Sulfuric acid 98% LDPE at 20°C-50°C: shows little or no damage after 30 days. HDPE at 20°C: shows effect after 7 days. Not recommended for use at 50°C. Tannic acid LDPE / HDPE at 20°C-50°C: little or no damage after 30 days. Tetrahydrofuran LDPE / HDPE at 20°C: show some effect after 7 day of constant exposure. Toluene LDPE at 20°C: show some effect after 7 day of constant exposure. HDPE at 20°C-50°C & LDPE at 50°C: show immediate damage. Trichloracetic acid LDPE / HDPE at 20°C: show some effect after 7 day of constant exposure. Trichlorethane Immediate damage may occur. Turpentine oil LDPE / HDPE at 20°C: show some effect after 7 days. Urea LDPE / HDPE at 20°C-50°C: little or no damage after 30 days. Xylene HDPE at 20°C: shows some effect after 7 day of constant exposure. LDPE at 20-50°C and HDPE at 50°C: show immediate damage. Zinc chloride LDPE / HDPE at 20°C-50°C: little or no damage after 30 days.